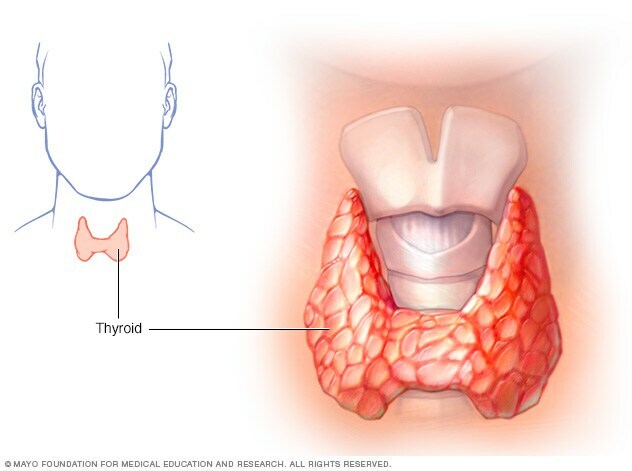 Hyperthyroidism (overactive thyroid) occurs when your thyroid gland produces too much of the hormone thyroxine. Hyperthyroidism can accelerate your body's metabolism, causing unintentional weight loss and a rapid or irregular heartbeat. Several treatments are available for hyperthyroidism. Doctors use anti-thyroid medications and radioactive iodine to slow the production of thyroid hormones. Sometimes, hyperthyroidism treatment involves surgery to remove all or part of your thyroid gland. Although hyperthyroidism can be serious if you ignore it, most people respond well once hyperthyroidism is diagnosed and treated. Sometimes an uncommon problem called Graves' ophthalmopathy may affect your eyes, especially if you smoke. This disorder makes your eyeballs protrude beyond their normal protective orbits when the tissues and muscles behind your eyes swell. Eye problems often improve without treatment. If you experience unexplained weight loss, a rapid heartbeat, unusual sweating, swelling at the base of your neck or other signs and symptoms associated with hyperthyroidism, see your doctor. It's important to completely describe the changes you've observed, because many signs and symptoms of hyperthyroidism may be associated with a number of other conditions. If you've been treated for hyperthyroidism or you currently are being treated, see your doctor regularly as advised so that he or she can monitor your condition. Hyperthyroidism can be caused by a number of conditions, including Graves' disease, Plummer's disease and thyroiditis. Your thyroid is a small, butterfly-shaped gland at the base of your neck, just below your Adam's apple. The thyroid gland has an enormous impact on your health. Every aspect of your metabolism is regulated by thyroid hormones. Your thyroid gland produces two main hormones, thyroxine (T4) and triiodothyronine (T3), that influence every cell in your body. They maintain the rate at which your body uses fats and carbohydrates, help control your body temperature, influence your heart rate, and help regulate the production of protein. Your thyroid also produces a hormone that helps regulate the amount of calcium in your blood (calcitonin). Graves' disease. Graves' disease is an autoimmune disorder in which antibodies produced by your immune system stimulate your thyroid to produce too much T4. It's the most common cause of hyperthyroidism. Hyperfunctioning thyroid nodules (toxic adenoma, toxic multinodular goiter or Plummer's disease). This form of hyperthyroidism occurs when one or more adenomas of your thyroid produce too much T4. An adenoma is a part of the gland that has walled itself off from the rest of the gland, forming noncancerous (benign) lumps that may cause an enlargement of the thyroid. Thyroiditis. Sometimes your thyroid gland can become inflamed after pregnancy, due to an autoimmune condition or for unknown reasons. The inflammation can cause excess thyroid hormone stored in the gland to leak into your bloodstream. Some types of thyroiditis may cause pain, while others are painless. Heart problems. Some of the most serious complications of hyperthyroidism involve the heart. These include a rapid heart rate, a heart rhythm disorder called atrial fibrillation that increases your risk of stroke, and congestive heart failure — a condition in which your heart can't circulate enough blood to meet your body's needs. Brittle bones. Untreated hyperthyroidism can also lead to weak, brittle bones (osteoporosis). The strength of your bones depends, in part, on the amount of calcium and other minerals they contain. Too much thyroid hormone interferes with your body's ability to incorporate calcium into your bones. Eye problems. People with Graves' ophthalmopathy develop eye problems, including bulging, red or swollen eyes, sensitivity to light, and blurring or double vision. Untreated, severe eye problems can lead to vision loss. Red, swollen skin. In rare cases, people with Graves' disease develop Graves' dermopathy. This affects the skin, causing redness and swelling, often on the shins and feet.